Early last year we put the Plaxton Leopard bodied Volvo B8R demonstrator through its paces (B&CB issue 1266, 7 March 2014) and with the exception of a few body issues that appear to have been overcome on subsequent vehicles were impressed with what we found, particularly the smoothness and quietness compared with the B9R. 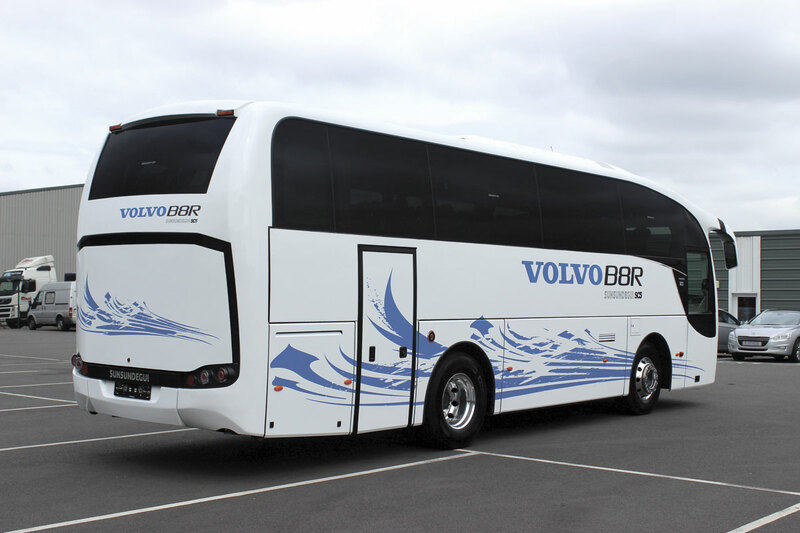 With the B8R Leopard combination selling well, Volvo has introduced a new option on the B8R, though not one that will compete with the Plaxton because it is aimed at an entirely different segment. 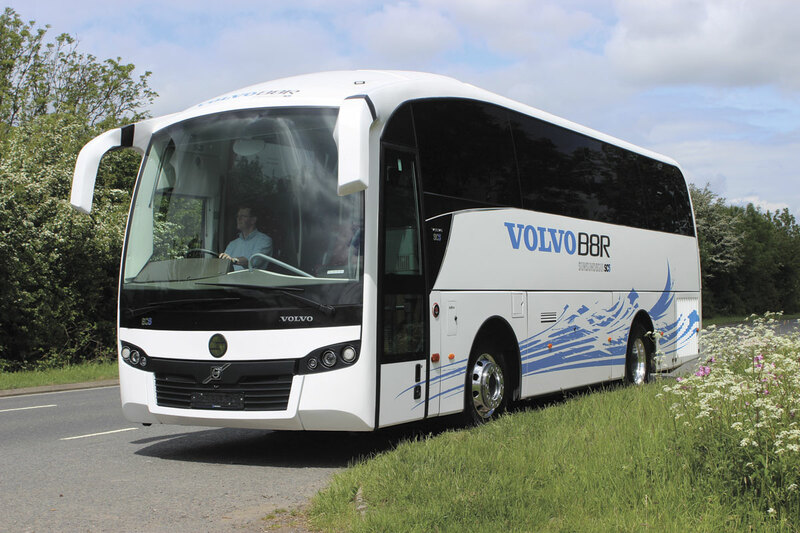 The debutante is the 10.3m long Sunsundegui SC5, which directly replaces the Sunsundegui Sideral 10 bodied B7R offered by Volvo Coach Sales prior to Euro6 and Stuart joined Volvo’s Norman Thomas to take a look at it. Introduced to the UK in 2009, the Sideral 10 was a scaled down version of the 3.50m high Sideral 330 range. 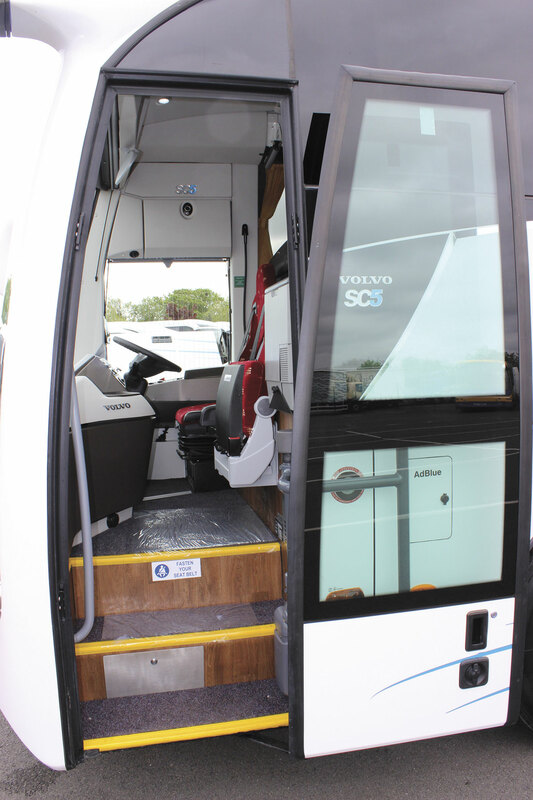 In the same way, the new coach is a scaled down SC5 which is itself directly based on the SC7 with the same saloon interior height. In contrast to the previous model, Volvo has no immediate plans to offer the SC5 in any other length variants in right hand drive. However, it will be offering it in an extensive range of options up to 15m in left hand drive markets. Although a longer prototype was built, the 10.3m SC5 will be the only Sunsundegui option Volvo offers on the B8R rather than the B11R in the UK and Ireland. 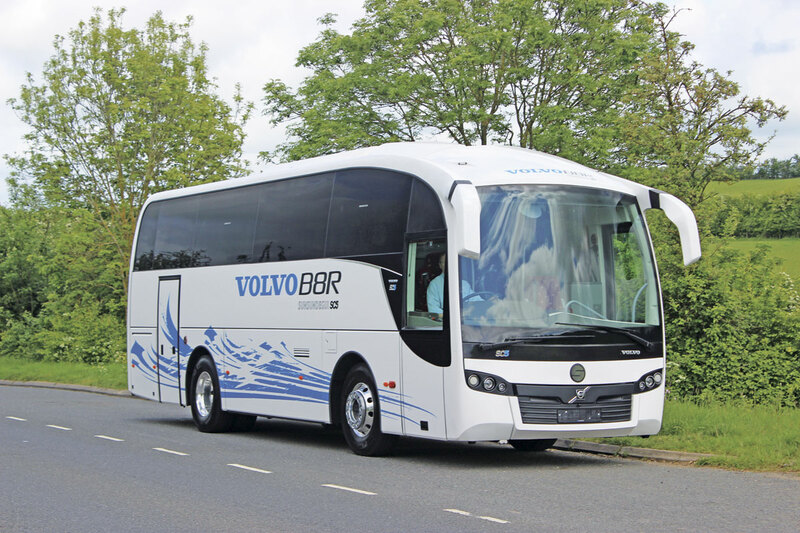 Sunsundegui, based in Northern Spain, has a longstanding relationship with Volvo which offers its products in a number of markets, at times in the past directly under the Volvo brand. It is not an exclusive arrangement as it continues to body other manufacturer’s chassis for the Spanish market. 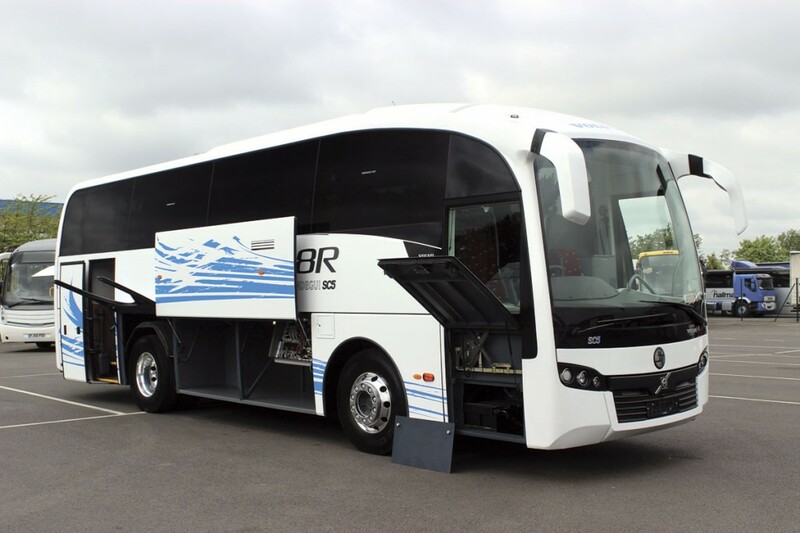 The business grew out of a rail vehicle repair and manufacturing workshop and though it did not build its first coach body until 1987, it now concentrates solely on coach and bus body manufacture. It went through a financially difficult period in 2009 which it survived with help from the regional authorities in Navarre and has now refocused and significantly reduced its cost base to give it a more secure future following a management and employee buyout in 2013. Total sales of 152 in 2013 are expected to have grown to over 300 this year. Clear evidence of confidence in the future came in 2012 when the new SC7 range was launched at the FIAA Madrid Show. 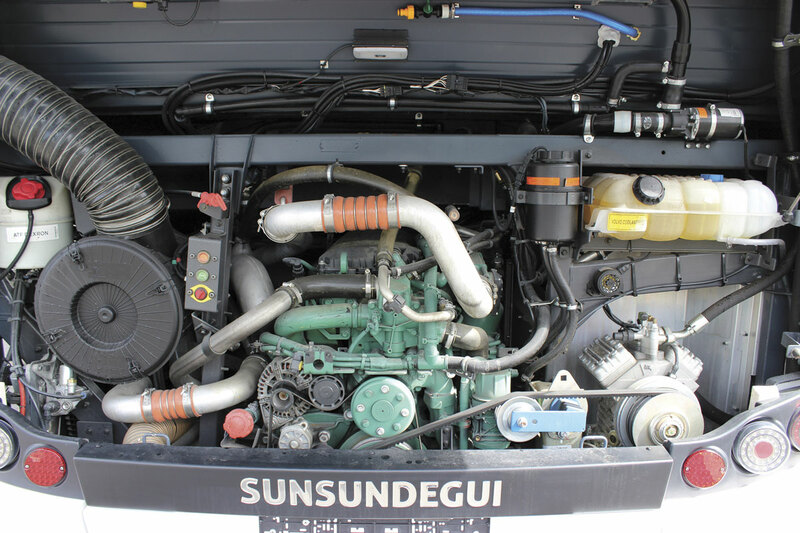 The Sunsundegui SC7 is nominally 3.7m high (3.5m plus 20cm for the air conditioning unit) and is offered at lengths between 12-15m on a variety of chassis. It retains strong hints of the earlier Sideral look but with a more attractive styling treatment incorporating a slatted stainless steel grille as well as a host of improvements. 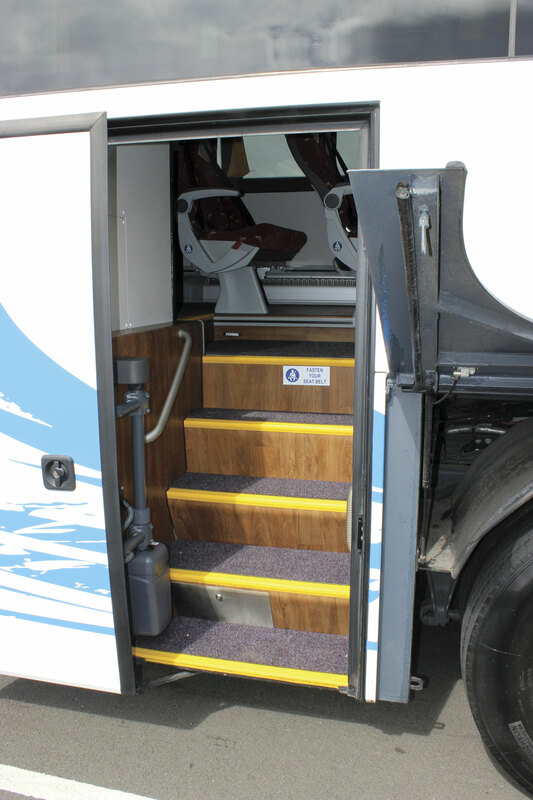 The SC7 is offered in the UK through Volvo Coach Sales on the B11R chassis at 12.3m (51 plus toilet), 12.6m (53 + toilet) and 13.1m (55 + toilet) on two axles and 14m with 59 seats and toilet on three axles. At last year’s Madrid Show the SC7 was joined by two further models. One was a new interurban type bus/dual purpose vehicle called the SB3, replacing the former Astral model. To me that sounded like a Bedford but it actually stands for Sunsundegui Bus – 3.3m high as SC7 stands for Sunsundegui Coach – 3.7m high. An SB3 low entry variant is also being introduced this year. Rather more relevant to the UK was the new SC5 which, as you have no doubt already worked out, is a 3.5m high coach (3.3m + 20cm). 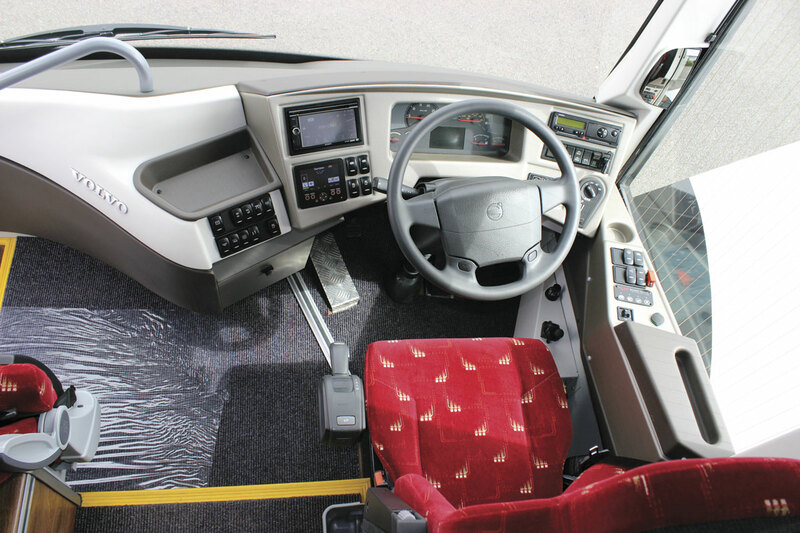 In left hand drive it will be offered for a range of lengths between 10.3-15m on two and three axles. Both products share common glazing units and are, like the SC7, modular designs that are both more straightforward to build and more flexible in the specifications that can be offered. Somewhat in advance of most other products in the market, they already meet the rollover requirements of the forthcoming ECE R66.02 strengthened rollover regulations. 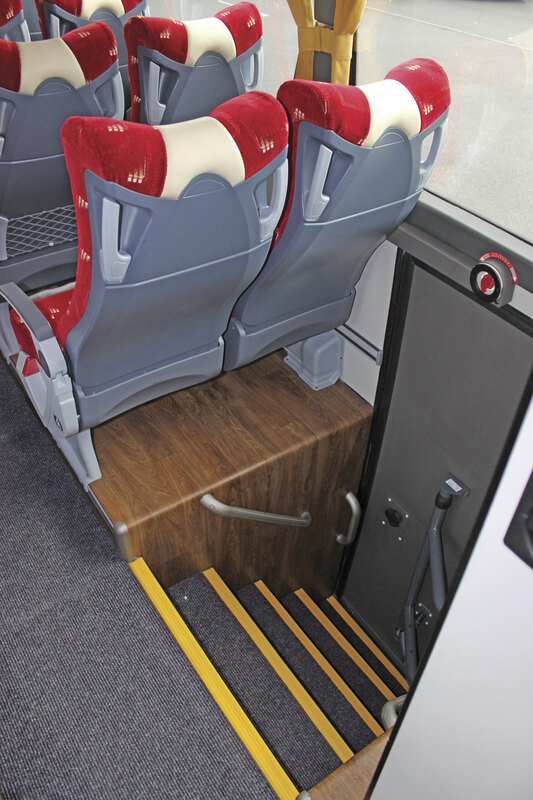 Normal seating capacities for the UK will be either 38 when a toilet is fitted or 41 when there isn’t one, all three of the additional seats being located in the rear row. 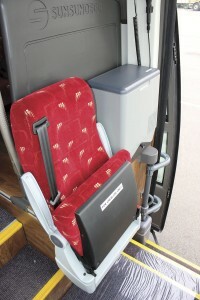 The seat specified is the Turkish built Sege recliner which has a plastic rear section, wider than average winged headrest and a maximum possible recline angle of 13 degrees. 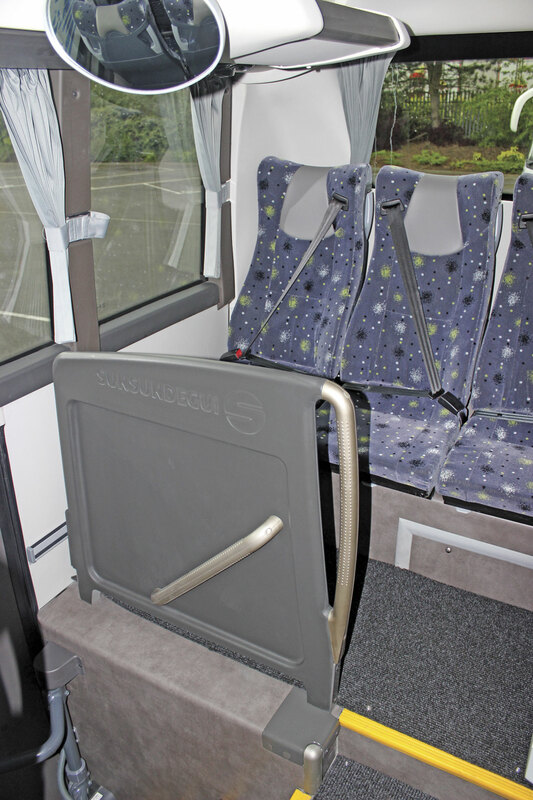 On the demonstration coach these were equipped with folding aisle armrests, folding footrests, magazine nets and leather effect headrest inserts. 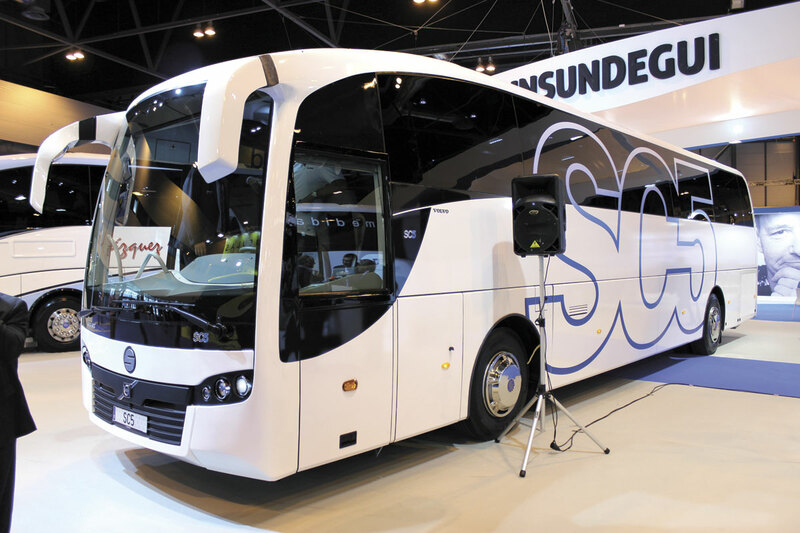 I recently spoke to Sunsundegui MD, Jose Ignacio Murillo Garralda, who explained that in developing the SC5 the company had tried to make a more flexible coach that could be used for roles from regional short distance to more luxurious tourist applications, though with a reduced specification to the SC7 with less trimming and more ABS. In construction terms the assembly is more industrialised with less manual work required. 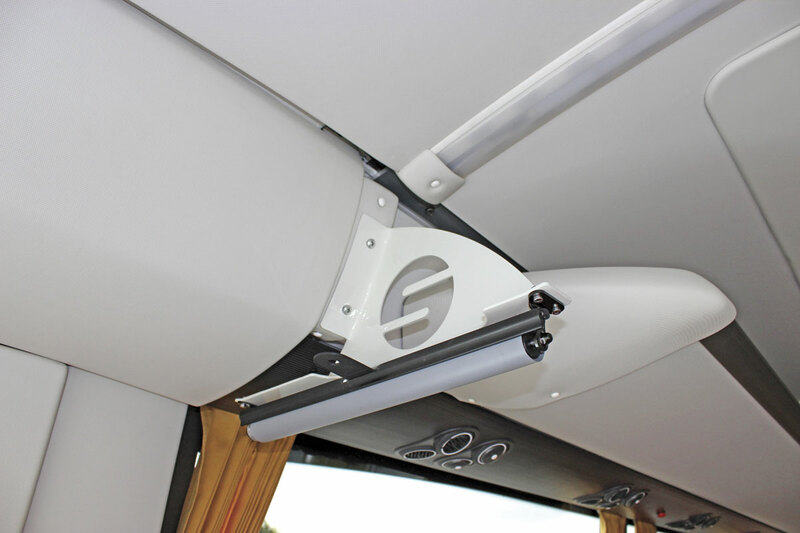 Though similar in concept, the racks are simpler one piece pultrusions made in Spain, and are not integrated into the rest of the ceiling mouldings to the same extent as on the SC7, with personal service functions mounted differently. 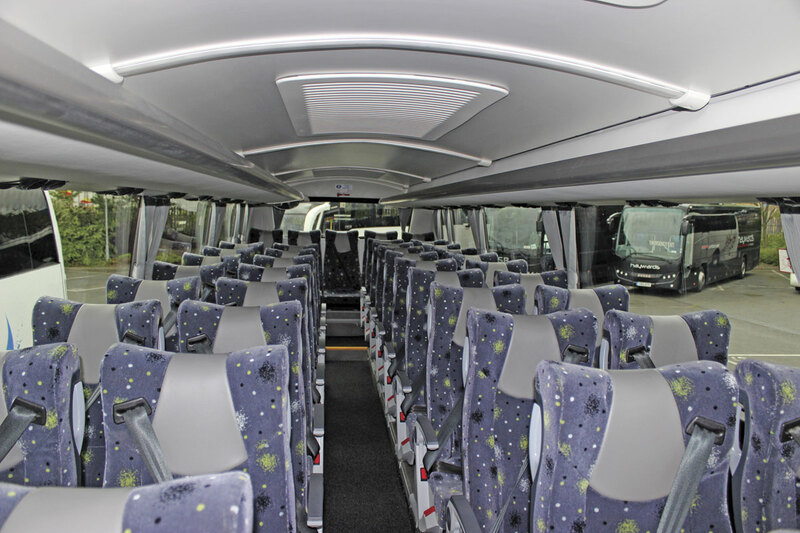 The ceiling panels are laminates and unlike the SC7, which has longitudinal lighting units, the SC5 has the LED lights mounted across the width of the coach at intervals. The front screen is common with the SB3 model while the rear window and mirrors are common with the SC7. Both the SC5 and SC7 have the same window units featuring a VG10 tint on the outer panels and a transparent inner panel, although there are options available including an inner VG10 tint panel giving a double tint that Sunsundegui say make curtains are unnecessary. I have seen this on an SC7 and it is very effective. Pretty but purposeful in appearance, externally the SC5 is easily distinguishable from the SC7 because, in addition to the lower height and a slightly more upright windscreen, the front grille panel is moulded in black whereas the SC7 has three stainless steel bars. Structurally, both models have stainless steel frames, although Sunsundegui does still supply carbon steel frames to the home market and export markets where corrosion is not an issue. 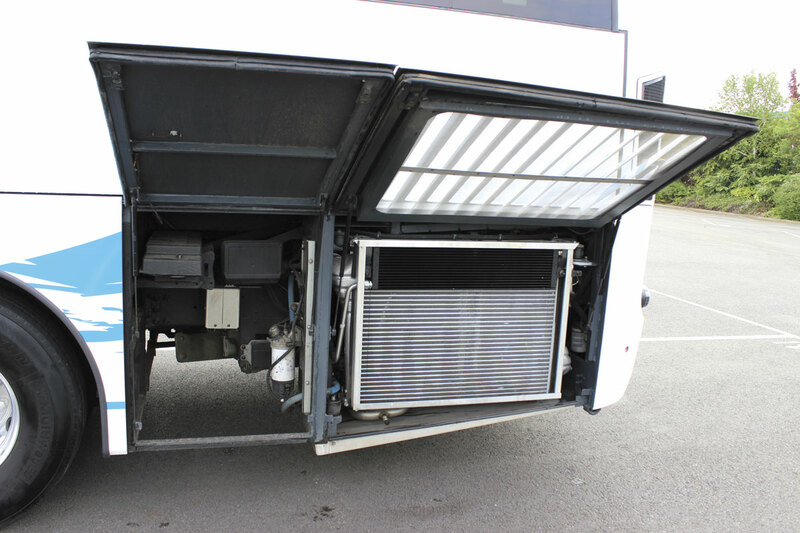 Well disguised within the lines of the coach is the roof mounted AC353 air conditioning, a slim ‘ultra-low weight’ unit that uses Micro Channel Heat exchanger (MCHX) technology and a reduced level of refrigerant. It is said to be easier to service and offer reduced life cycle costs. A distinct difference between the SC7 and SC5 for the time being is that the SC5 has a fully multiplex electrical system: the SC7 will not benefit from this until 2016/2017. Modules for the system are sourced from the German manufacturer, IFM, with whom Sunsundegui works. 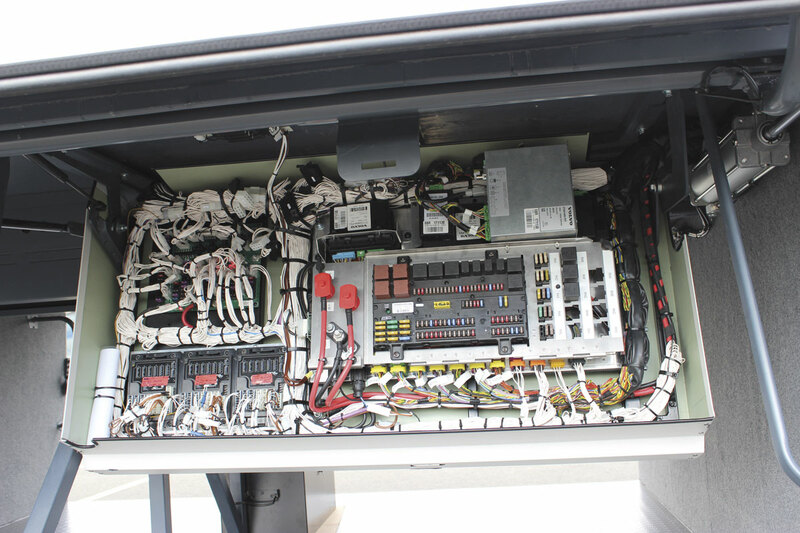 The advantage of the multiplex system is that it if the control module fails to pick up a signal from a component it knows there is a fault, the diagnosis of which is also easier if you know how the system works. 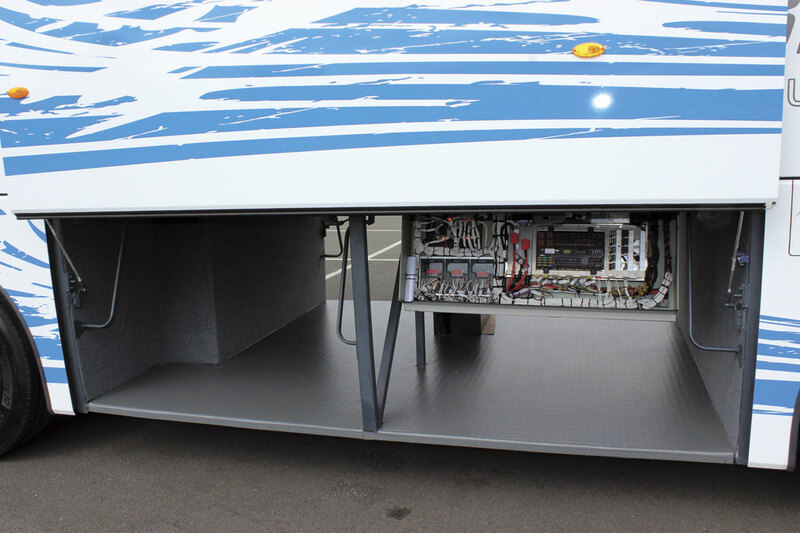 The system covers the whole body, including the climate control and chassis connections. 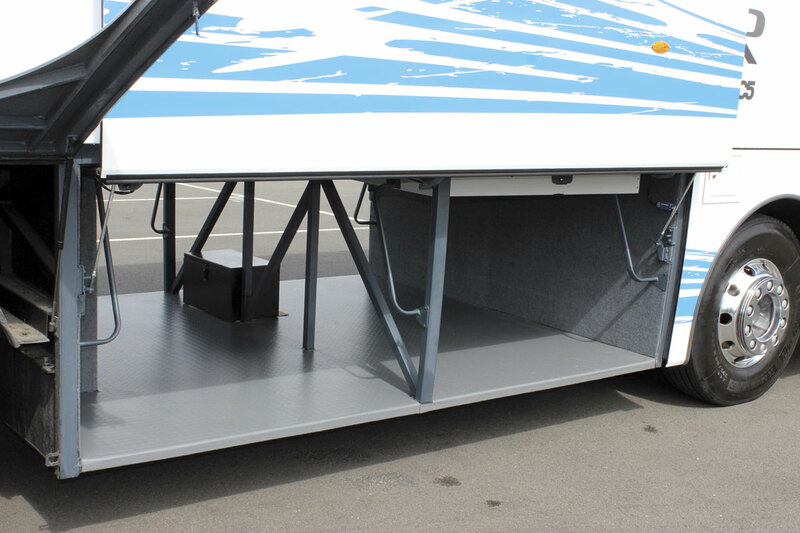 As it is only 10.35m long, the SC5’s continental door can only be offered within the rear overhang at the offside rear. 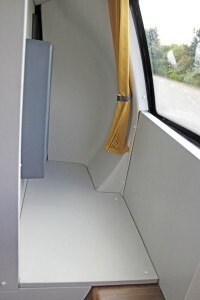 Maximum luggage capacity is six cubic metres and to avoid reducing this, the only place a toilet can be offered is within the saloon at the offside rear between the stairwell and the rear, as was the case on the coach we examined. It is a fairly spacious unit with moulded interior. A surprising amount of unused space remains between the rear of the compartment and the rear window and while Norman suggested that you might put a drinks machine there I wasn’t entirely convinced. A Masats powered plug door incorporates two glazed window sections covering all but the lower part of the door, ensuring a good view out. The dash is a combination of cream, brown and bronze trimmed mouldings and appears to be well laid out with everything to hand. Negotiating the three steps from the ground to the platform at the front entrance is aided by substantial rails on the left, though more to hold on to on the right would be useful, such as a handle upturned base cushion of the courier seat. There are two steps from the platform to the slightly sunken aisle which has a slight slope at the front end. 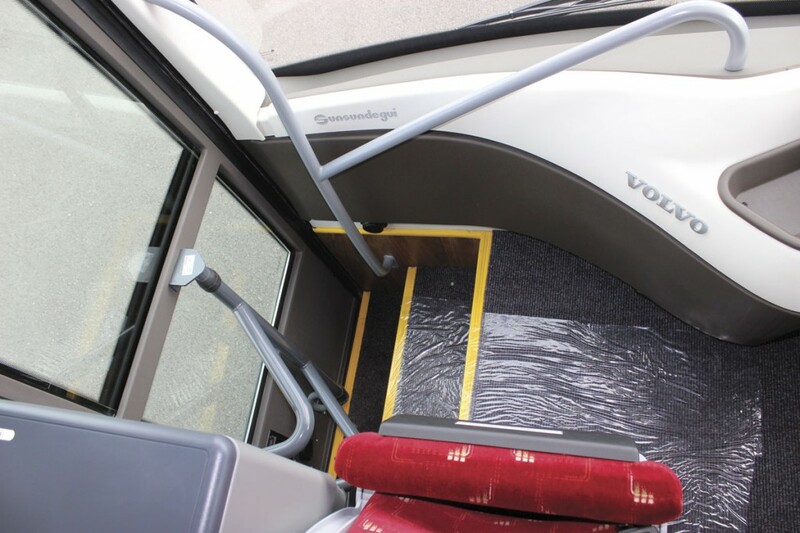 To maximise space, the seat platforms extend further on the nearside than the offside by the depth of the intermediate step. 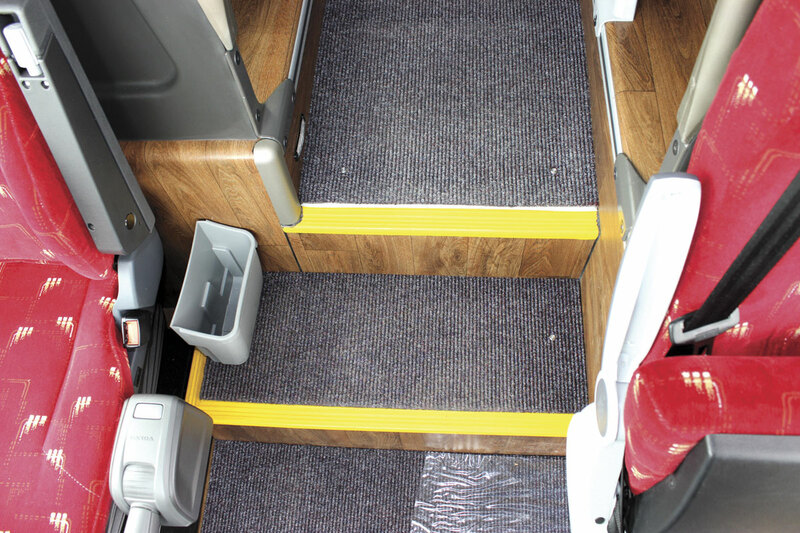 Flooring is a wooden plank effect laminate that, unusually, is curved over the edge of the aisle, with the seat mounting points located in a rail beneath the lip on the side riser as well as on the body side. I was concerned that the edge would encounter more wear than other sections of the flooring and the laminate might wear thin leaving it looking less attractive after a few years, and when I mentioned this subsequently to Sunsundegui’s Alex Irizar he assured me that they had been using the system for some years and it did not happen. A benefit would appear to be that cleaning is easier. Interior lighting is all LED and there are blue LED lights that come on in the interior at night when the sidelights are on in addition to the running lights. Externally, filling for the 400-litre diesel tanks is on both sides, whereas that for the 64-litre AdBlue tank is on the nearside only. Somewhat perplexingly the filler for the screen wash is also behind the AdBlue flap but you can’t fill it without a watering can with a hose or some similar such device. I consider screen cleaning a safety element and would prefer replenishing the reservoir to be a far simpler process easily accomplished at a hotel or other such destination. 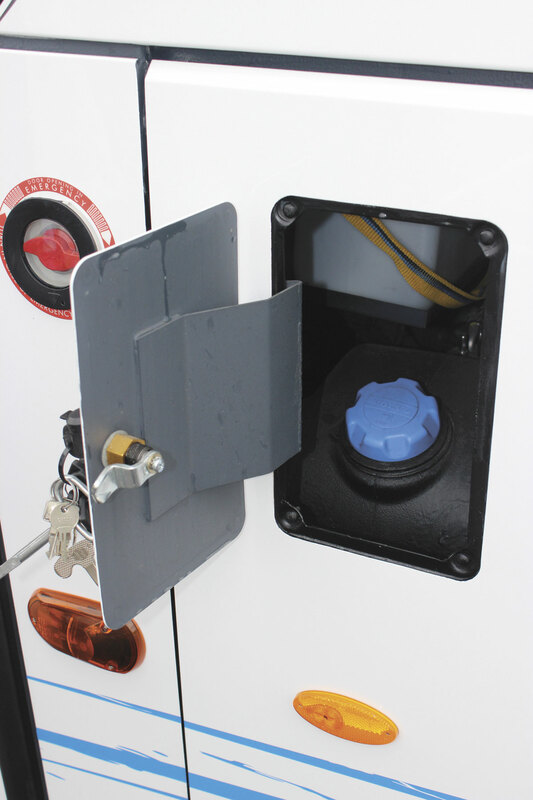 The filler for the diesel tanks is a push in nozzle rather than a removable cap, which gives a degree of anti-syphon protection and is both quicker and cleaner in operation. The light units hinge out when their retaining wing nuts are undone and the back panel is removable. Within the central locker which has a capacity of six cubic metres, access is unrestricted as the toilet is saloon mounted at the rear. 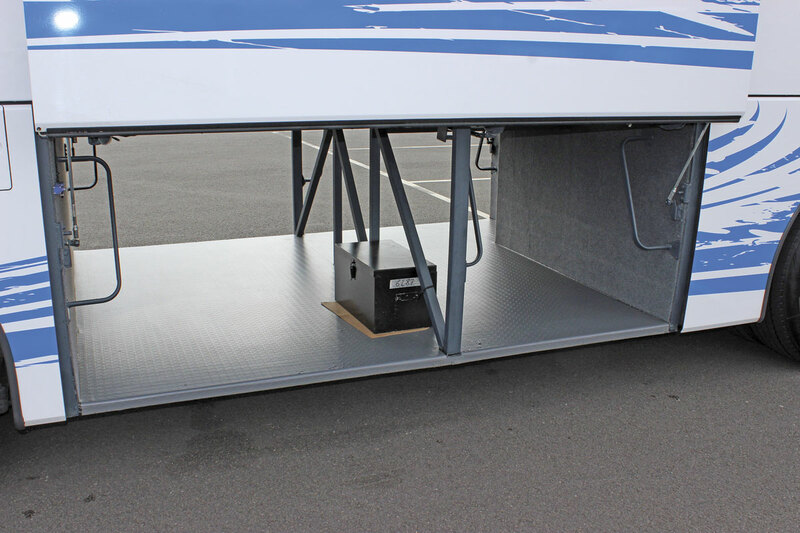 On both sides, the locker doors are powered cantilever units with a central locking facility. This is in contrast to the doors, including the emergency exit, which now lock manually rather than being controlled by a ‘plip’ as the French used to call them. The electrical panel is in a drop down locker in the locker ceiling. Though this is on the UK offside which is not ideal if you are at the side of a UK motorway at night. They are easy to open using a budget key. Equipped with the I-Start battery system with one set of batteries solely dedicated to starting the vehicle, the consumer batteries are located beneath the driver along with the front fuse box and the main electrical switch. 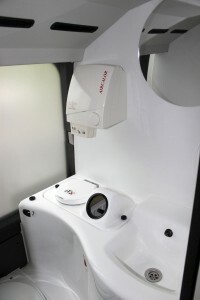 They are revealed by opening a locker, which also exposes the mechanisms for the electric driver’s window. Located at the nearside rear, the radiator/intercooler with oil cooler above can be swung out once the inlet connection (which won’t stretch) has been disconnected and two screws have been undone. 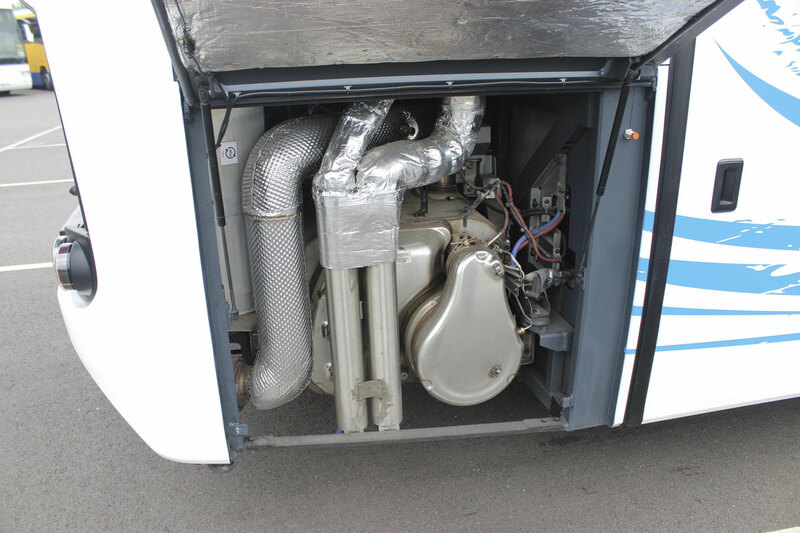 Opposite on the offside is the exhaust system which includes all of the elements of the SCR system including the oxidation catalyst and the filter. Located behind a kidney shaped cover, the filter is the only maintainable element, Norman pointed out. The B8R also features EGR but it isn’t something you can easily spot, as it is basically just a valve. The wheelarches are hinged with two catches and there is an inner arch cover. Alcoa Durabright alloy wheels are standard. 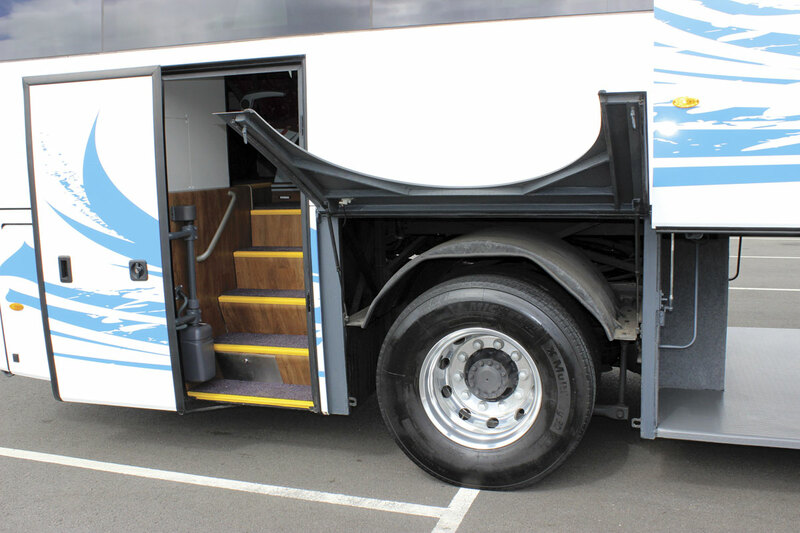 One slight practical concern I had was that the front corner panels, which are one of the more vulnerable areas of a coach, are not removable and there is no obvious moulding line to blend paint into. Were you to damage one, it would be necessary to put an infill panel in. When they arrive at the Sunsundegui plant in transport chassis form, all B8R chassis have the same 3250mm wheelbase, regardless of the length of the body they will eventually carry. This is then cut very precisely within the wheelbase and the main body structure added with the chassis locked in a jig. The engine is the Euro6 Volvo D8K 7.7-litre, six-cylinder in-line unit with common rail injection. It uses both EGR and SCR technology to control exhaust gas emissions. Three variants are offered on the specifications sheets delivering 280hp, 320hp or 350hp. Ours had the largest D8K350 unit which delivers 258kW/350hp and peak torque of 1,400Nm at 1,200-1,600rpm, though Volvo will offer the 320hp unit as an alternative in the UK, delivering 200Nm less. Gearbox options for the UK are either Volvo’s own I-Shift AT2412E 12-speed unit or the ZF Ecolife 6AP1400B six-speed fully automatic transmission. This is a departure from Euro5 practice when the B7R was only offered with ZF transmissions and the B9R was only offered with the I-Shift. Examples of both transmissions are already in the build programme. 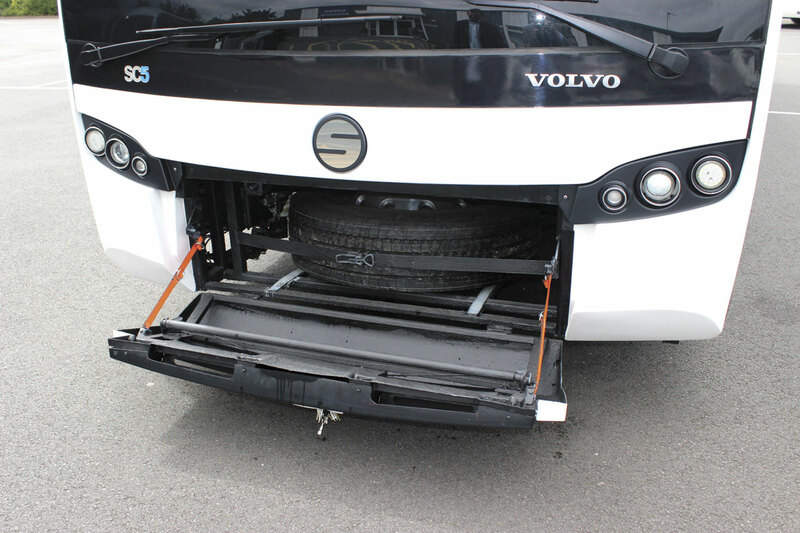 The rear axle is the Volvo RS1228C and the front axle is the Volvo beam axle system. Despite the additional weight of the chassis, which rises by around 300kg because of the extra emissions equipment, the overall weight has been kept on a par with the previous B7R product through weight reduction measures that Sunsundegui have achieved. Currently undergoing final verification trials in Sweden is a B8R SC5 equipped with the additional radar controlled lane departure warning and emergency braking systems that will be mandatory requirements for Whole Vehicle Type Approval on every Class 3 vehicle from November of this year. These systems were not installed on the coach tested, though it was fully prepared to accept them once they are signed off. It was unfortunate that Andrew Fowler, who had planned to join me for the day, was suffering with a swollen elbow and unable to drive, so I relied on Norman to try his best to be impartial. He had driven the earlier Sideral 10 B7R on a number of occasions and felt that in comparison the SC5 B8R had a different, more sophisticated feel to the driveline as well as a more robust overall feel. He also found it more reassuringly stable in crosswinds and liked the ‘very efficient’ hydraulic retarder. 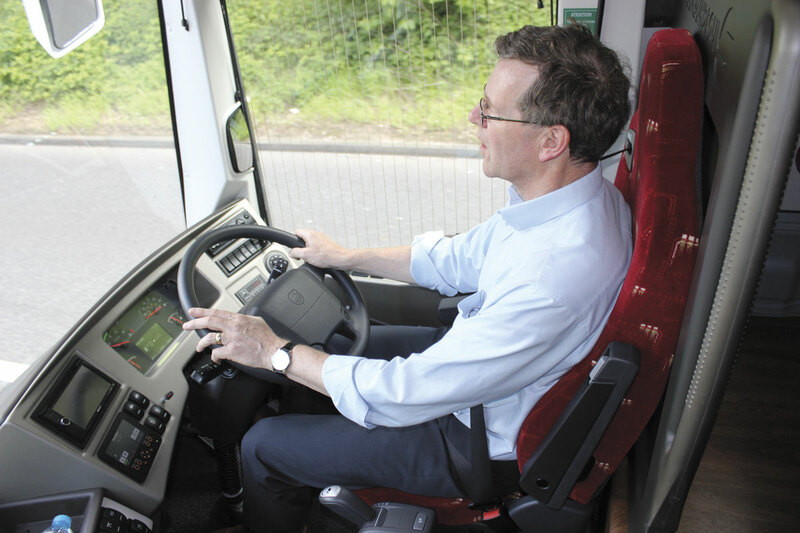 Letting the I-Shift operate in automatic mode and driving in a fairly relaxed manner on cross country roads, it decided to pull away on the level in fourth changing to sixth at 15mph, eighth at 18mph and ninth at 25mph. From there it progressed to tenth at 30mph, 11th at 36mph and finally 12th at around 45mph generally changing up at around 1,500rpm, well within the green band which extends from 1,100 to 1,600rpm. On these cross country roads Norman described its progress as ‘romping’ and that seems a pretty fair description of its eagerness, with a measured pull away and generous torque from 1,100rpm upwards, ensuring that it maintains its speed well on hills, even steep ones. Earlier, on the motorway, it had held 11th until around 51/52mph changing up at 1,600rpm, though Norman found that in top you could drop well below 50mph and down and as low as 1,150rpm without it changing to 11th, though backing off the throttle would induce the change. At 60mph in 12th it was recording 1,400rpm and on the limiter at 100kph it was showing close to 1,450rpm. Something Norman noted was that, with his long legs, it was difficult to get the seat as far back as he would have liked, even though he had it tight against the decency screen behind. 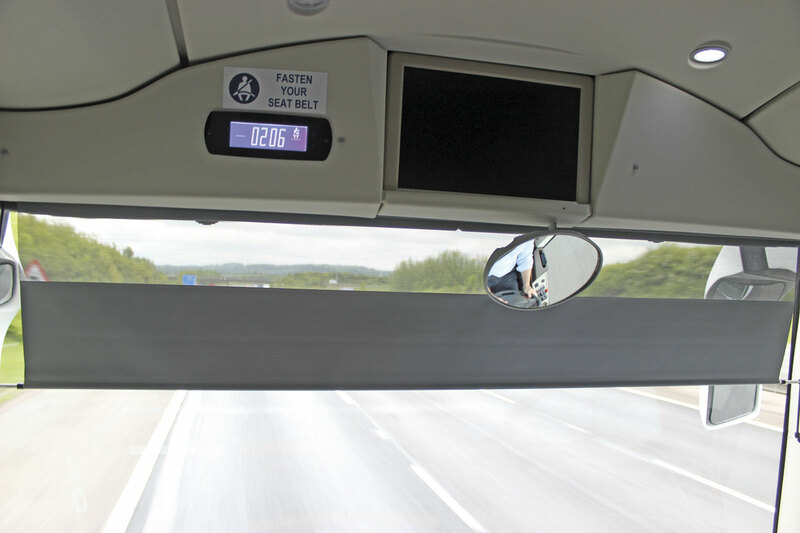 An innovation Sunsundegui has introduced is a small blind spot mirror inset within the moulding of the front offside A-pillar that gives extra confidence when overtaking. Norman noted that cars stay in it for longer than in the main mirror and found it especially useful when moving out into the next lane. 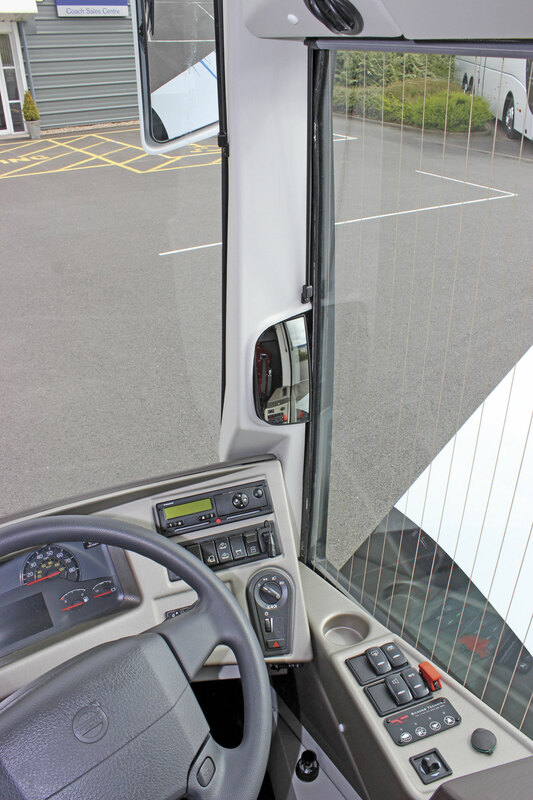 The A-pillars are quite thick and if you are sat back the right hand side of the main offside mirror can be lost. There was some mirror vibration but not sufficient to degrade the image. I noted that there was no mirror cut out in the full width sunblind. Norman found the steering responsive, the brakes progressive and the coach easy to position and manoeuvre, demonstrating the point when an illegally parked car blocked the exit to Moreton in Marsh coach park by turning it around within the confines of the coach park area. Overall he found the diminutive length made it very easy to drive giving big coach characteristics within a small package. From the passenger perspective there is very little wind noise, though there was a little door rattle. This was the first production coach and one anticipates that such issues will rapidly be cleared up. In terms of ride quality it coped well with smoothing out the bumps. The road was extremely undulating and unsurprisingly the unladen coach was rather lively at the back with quite a bit of side to side motion, though one anticipates that a laden coach would behave completely differently. The engine was quietly audible but not at all noisy though there were some rattles from the racks. When it was operating there was quite a lot of noise from the air conditioning compressor, which disappeared as soon as it cut out. It is remarkable how the quieter Euro6 engines have highlighted noises in systems that never seemed an issue before. One aspect I liked, but that many coachbuilders miss, is that the double seat at the rear nearside is slightly inset to give greater shoulder room to the passenger next to the window. I realise this is not possible if you have a five seat rear but as the there was a rear toilet and no centre seat it made sense to take the opportunity to do so. It is possible to specify a nearside cassette lift with an additional side door to the rear of the front axle, the only position it can go. 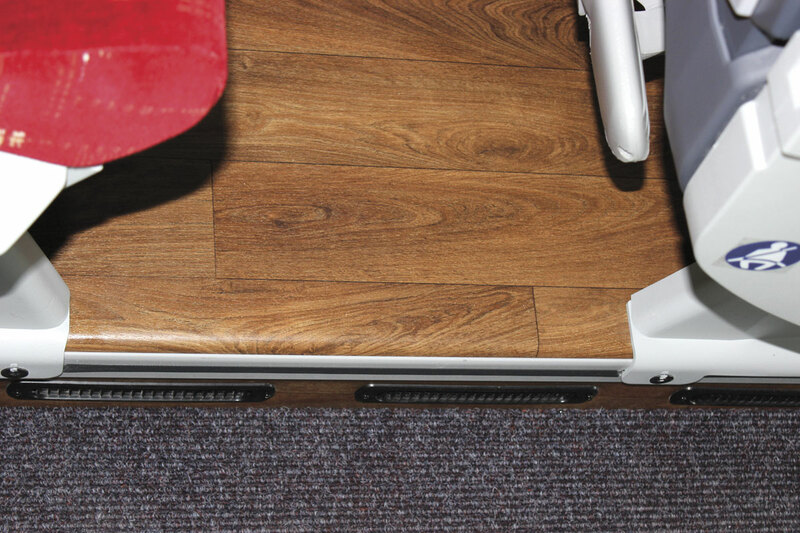 A choice of lift options is available, all of which are fitted across the floor area of the luggage hold, and have a considerable impact on its capacity. It is not anticipated that the SC5 B8R will be a volume seller, but demand for it has been healthy to date. The first delivered was a 38-seat example for Kennedys in Southern Ireland, while the vehicle we looked at has been sold to P.J.Ellis of London. O’Connor’s, another Irish operator has taken a 38 seater and two with 41 seats and automatic transmissions will shortly be delivered to McNee’s in Scotland. 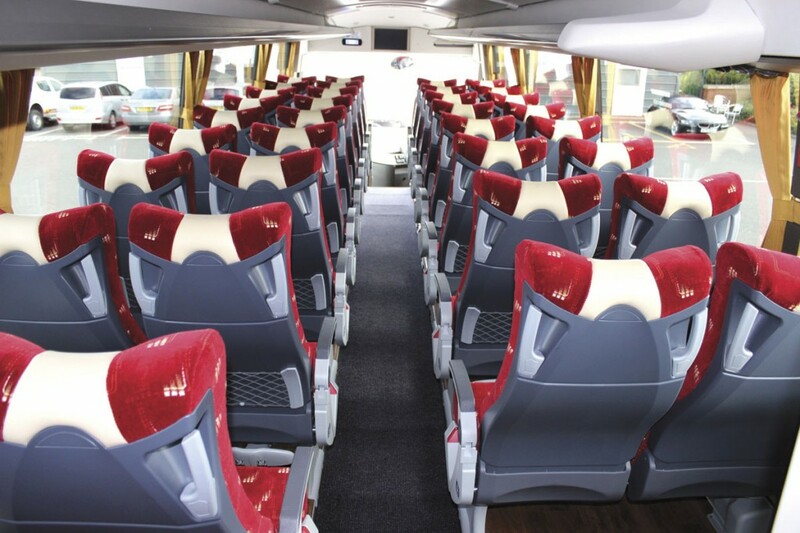 Premium of London will also be taking a 41 seater. At the time of writing two automatic examples were available from stock. 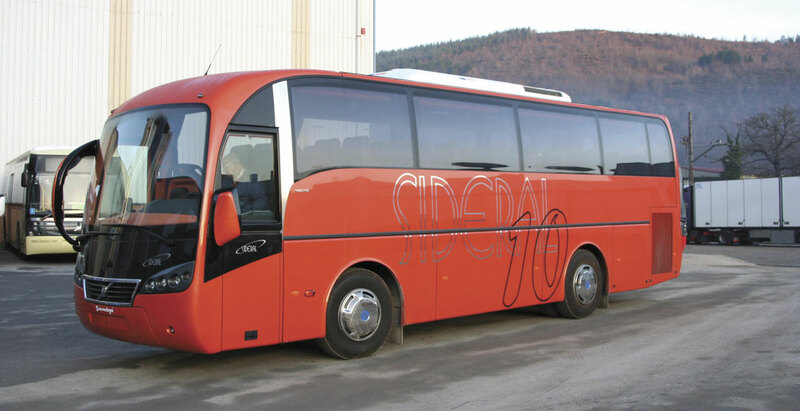 The market for heavy duty midicoaches is not a massive one and the Sunsundegui SC5 is not without competition from the likes of the Plaxton Panther Cub, the short version of the Irizar i6, and similar length alternatives from Van Hool, Temsa and Beulas among others, so it would be naive to expect it to sell in huge numbers. 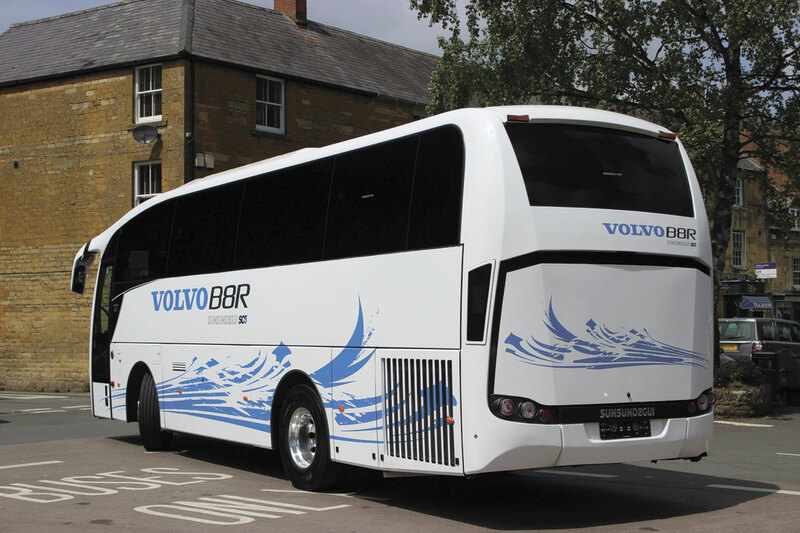 Nevertheless, that Volvo Coach Sales have had early success in attracting custom for the coach is a positive sign. It is too early to make any predictions about residual values but I’m told that Sideral 10s readily find buyers and there is no reason to think that the appeal of the SC5 will be any less enduring. A few years ago you might have been reticent about investing in a Sunsundegui because with the company seeking protection from its creditors there is always a concern about long term value and support. Today, the new management team does appear to have successfully sorted these issues out and put itself on a secure footing again, enabling operators to buy with renewed confidence. There has been a price rise with the launch of the enhanced specification of the SC5 as well as the massive investment in engineering that the introduction has required. 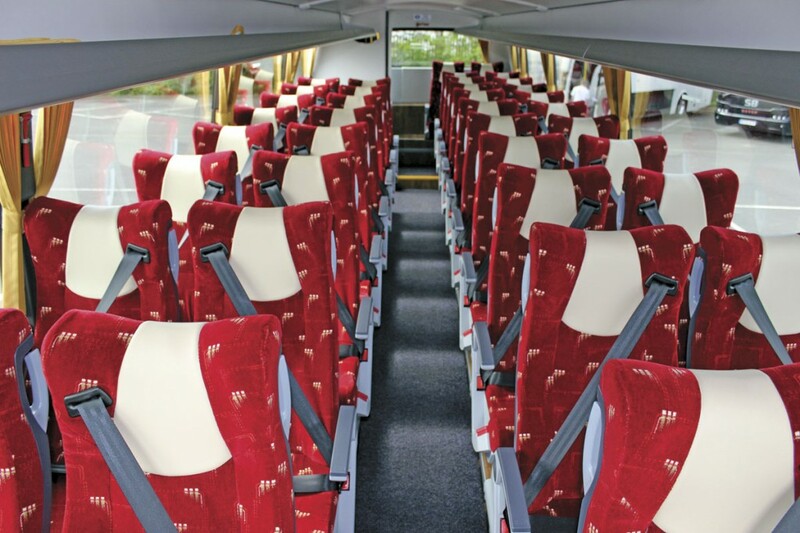 Together these factors result in a retail price for the new coach of £198,000 in 41-seat form, with a premium of £7,000 taking it to £205,000 for the version with toilet. I was somewhat taken aback by the lack of used Volvo Coach Sales stock in the yard at Coventry which has always been well populated on my previous visits. Of ten pre-owned vehicles, three sported prominent SOLD stickers and one was a service bus, leaving only six coaches available for purchase of which two were 15m Plaxton Panthers, a model that enjoys a somewhat limited range of second life possibilities. I liked this latest Volvo Sunsundegui combination and welcome the fact that at a time when many manufacturers are restricting the ranges they offer in the UK, Volvo is still prepared to develop and offer models that whilst not major volume products, enable operators to purchase a coach that ideally suits the needs of some applications. It is also encouraging that the Sunsundegui brand has not only survived but also moved forward with the product it is offering.